It’s easy to stand out from the rest with die-cut business cards. UPrinting’s die-cut business cards come in a variety of interesting shapes, perfect for making that first contact with your client more memorable. Customers who get a well-designed die-cut business card are far more likely to remember you than if you gave them a traditional rectangular card. The variety of die-cut shapes we offer also makes it possible to better match different brands and logos. Standard sizes and shapes for die-cut business cards include 2” x 3.5”, 2” x 2”, and 1.75 x 3.5” rounded corners; 2” x 3.5” leaf; 2” x 3.5” single rounded corner; 2” x 3.5” half-circle side; 2” x 3.5” oval; and 2.5” circle. Available stocks include thick 14 pt. cardstock in gloss, matte, or UV, and premium 16 pt. stock in gloss or matte. Die-cut business cards can be printed on the front or both sides and can be ready to ship in as soon as 2 business days. This range of shapes and sizes make custom die-cut business cards a great choice for professionals in all industries. Artists, designers, and other creative fields especially benefit from uniquely shaped business cards. 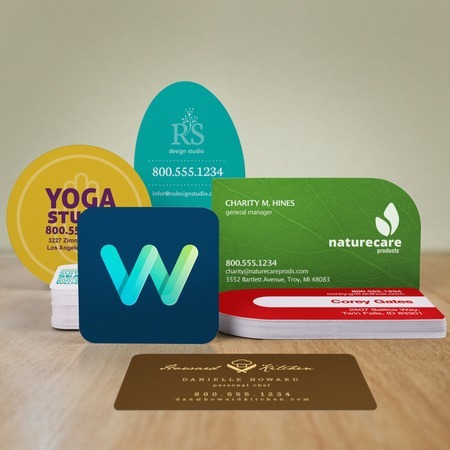 Businesses with a seal or round logo can also use circle business cards as a classic alternative to rectangular cards. The size of your business card depends on your needs and/or wants as a businessman. Although standard cards have a size of 3.5” x 2”, an.. Customizing the design of your business cards is one of the many ways to move away from plain-looking business cards and make them more exciting and..